It describes a challenge facing local food systems — made up of small farmers, their markets, processors and distributors — that have thus far been able to create a pretty public image, but not a big economic impact on their communities. The new nonprofit Northern Colorado Food Cluster hopes to bring cute to scale and put more local food on people’s dinner tables, starting by raising $50,000 by the end of the year to add to $30,000 that the city has already invested. Short-term, the money will be used to hire a full-time executive director for what is expected to become an umbrella organization over Northern Colorado food; in the long-term, the cluster sees itself as a future clearing house for nonprofits such as FoCo Cafe and the Growing Project, and for small farmers, loosely organized at present. Among its potential projects, the Food Cluster envisions one Northern Colorado marketplace, open year-round in the same spot for farmers to sell seasonal produce; butchers to sell local meat; vendors to sell honey, cheese and flowers; and chefs to offer cooking classes to the public. What started as a grassroots movement solidified last month when the cluster gained nonprofit status, took over the Fort Collins’ Winter Farmers Markets as its first project and, in early November, after more than two years of preliminary community meetings, began a membership drive to move toward a more organized structure. For now, the theme of the most recent November community meeting was finances. Organizers, including Houghteling and other city workers, farmers, a Colorado State University doctoral student and an economist, hope to raise $50,000 with a combination of memberships, starting at $50 per year for individual members and working up to $5,000 per year for founding sponsors. Industry clusters are groupings of interconnected companies and institutions in a particular field, according to the city. In Fort Collins, industry clusters exist for clean energy, water, bioscience, information technology and even culture. In U.S. cities such as San Francisco; Portland, Oregon; and Louisville, Kentucky, food clusters also exist. The tasks of a food cluster, and any industry cluster, can be nebulous until carried out. For Northern Colorado, it could mean acquiring land for small and emerging farmers; writing grants for existing food nonprofits; creating jobs through collaborative projects with school cafeterias or food banks; and helping to open that year-round community marketplace for farmers, butchers and other vendors. Each year, the city of Fort Collins has a certain amount of money to allocate to its clusters; in early 2014 it awarded $107,000 to music, small business and startup clusters, among others. The NoCo Food Cluster received $30,000 of that funding, with the stipulation that it be matched by private donations. The Food Cluster hopes to attract industry members such as restaurants, grocers, farmers, distributors, processors and brewers, as well as other businesses and community members interested in Northern Colorado food. 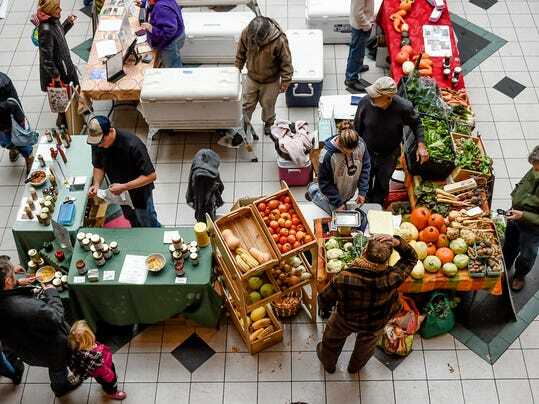 Aside from attracting members, the cluster’s first task is to manage the Winter Farmers Markets, which have switched hands over the past eight years. The winter market is a nice, cute stop on a Saturday, but Houghteling said it also is a crucial part of Northern Colorado’s food system. The market’s most recent organizer, Be Local Northern Colorado, dissolved earlier this year. For that reason, Colpaart and the other NoCo Food Cluster founders hope to address leadership and finances first within the new nonprofit. The movement to build local food systems is growing in Colorado; around the state, 18 communities are working on councils specifically to address food policy and public health, Thilmany said. But Northern Colorado is unique in its approach to food from an industry and economic standpoint. Colpaart is perhaps both the Food Cluster’s biggest strength and a sign of its current weakness. The CSU doctoral student in food systems was hired temporarily to head the nonprofit and get it to a safe starting point by the end of 2014, when the cluster hopes to be able to hire an executive director. Since starting in November, though, the cluster’s membership drive has raised more than $12,000. And while Colpaart can’t tell prospective partners exactly what projects to expect from the Food Cluster, she said it will provide resources and expertise for community members, businesses and existing nonprofits. Or, as Houghteling put it: a critical mass and the multiplier effect for these institutions.